It should be noted that Jersey is a separate legal jurisdiction and was not subject to the poor relief legislation covering the United Kingdom. 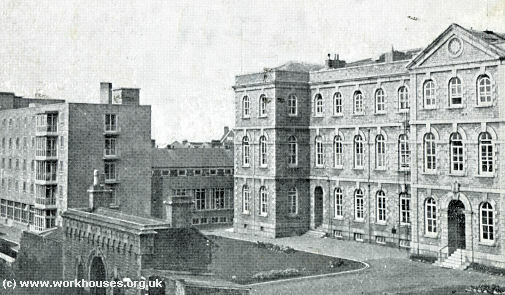 The main establishment providing poor relief in Jersey was the Jersey General Hospital and its Poor Law Infirmary, originally founded in 1741. Until 1839 it was administered by a "Comité des Pauvres" (Committee for the Poor). However, two major fires in the 18th and 19th centuries destroyed its early records. DESTRUCTION BY FIRE OF THE GENERAL HOSPITAL AT JERSEY. On the night of Monday, the 18th ult., the General Hospital, Gloucester-street, Jersey, was almost totally destroyed by fire. At about half-past eleven smoke was perceived issuing from the roof, followed shortly after by flames. The inmates and servants of the establishment had all retired to rest, and it was with difficulty that they could be aroused. The first thought of Mr. Arthur, the governor, was to provide for the safety of the three hundred inmates who occupied the building; and, with the help of the servants and of several persons brought to the spot by the cries raised in town, the whole of the invalids were removed in safety. The "worst cases" were conveyed to the outhouses, but the greater part congregated in the garden, where they were supplied with blankets and other articles of covering. A large portion of furniture, bedding, and other effects were saved, as were likewise the portrait of the founder of the establishment, the record, and other valuable documents. Meanwhile the fire had made rapid progress, and had spread along the entire length of the roof, descending into the upper story. Several fire-engines were shortly brought on the spot, but the fire spread with great rapidity in its downward course. From the first moment it was evident that the main building was doomed, and, consequently, the efforts of those employed were directed to protect the two wings, which had still remained intact. The communications were thereupon cut off, and the engines worked manfully. In a short time it was perceptible that the great body of water poured in at the gables had made an impression on tho fire. At about five the fire was mastered, and all further apprehension had ceased. Happily, no lives were lost, nor did any accident of a serious nature occur. 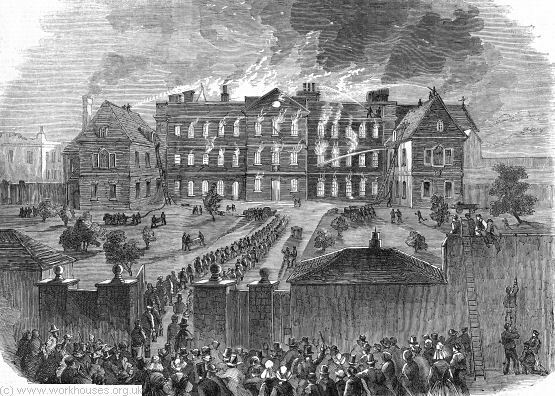 Jersey General Hospital Fire, 1859. Jersey General Hospital and Nurses' Home, 1950s. 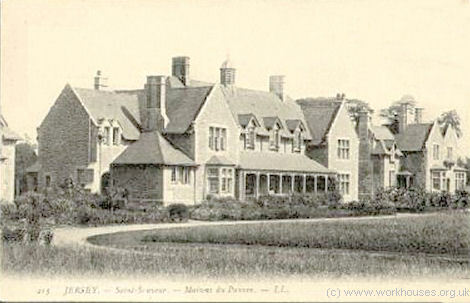 In the early 1900s, there was a 'Maison des Pauvres' (poor-house) at St Saviour's. The building is still there, and is now the centrepiece of the Victoria Cottage Homes, a small estate of houses for the elderly. Maison des Pauvres, early 1900s. The Jersey Archive, Clarence Road, St Helier, JE2 4JY. Holdings: Original Minute Books of the Comité des Pauvres; Hospital Committee Minute Books; Jersey General Hospital Admission Registers (1839-1841,1879-1948); Pensions to the Poor of St Helier (1864-1898); Baptism Register at the General Hospital (1938-1978). A transcription of entries (1873-82) from the Hospital's admissions book is planned to be made available sometime in 2012. Library of the Société Jersiaise, 7 Pier Road St Helier, Jersey JE2 4XW. Has a few odd items.